St Mildred's is an Anglican Evangelical Church in the Diocese of Southwark of the Church of England. We are located in Lee, in the London Borough of Lewisham. ﻿You are warmly invited to come and visit us at St. Mildred's! Our worship is a mixture of traditional and contemporary, old and new. In our teaching we aim to be faithful to God the Father, through his Son Jesus Christ in the power of the Holy Spirit. We believe that God has given us a written record of correct teaching about him in the Bible. Because of this we base all our teaching on the Bible. By believing in the living Lord Jesus Christ, we find new life and hope for the future. It is our prayer that those who visit us will find a genuine, warm welcome and be able to meet Christ for themselves. He is our hope, encouragement and inspiration. We are ordinary people from a wide variety of backgrounds. We acknowledge our failings, but, with God's help, strive to be a caring community. We meet together as a family with facilities for everyone. On Sunday mornings, these include activities for children and young people from 0 to 16 years. 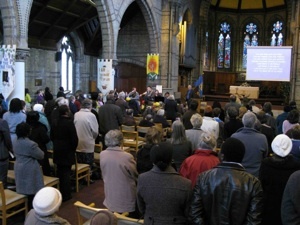 The church is accessible for disabled people, and there is an induction loop available for those with hearing difficulties. Coffee and tea are served after the Sunday morning service. We hope that you will find it difficult to leave without someone saying 'hello'. We look forward to getting to know you better.